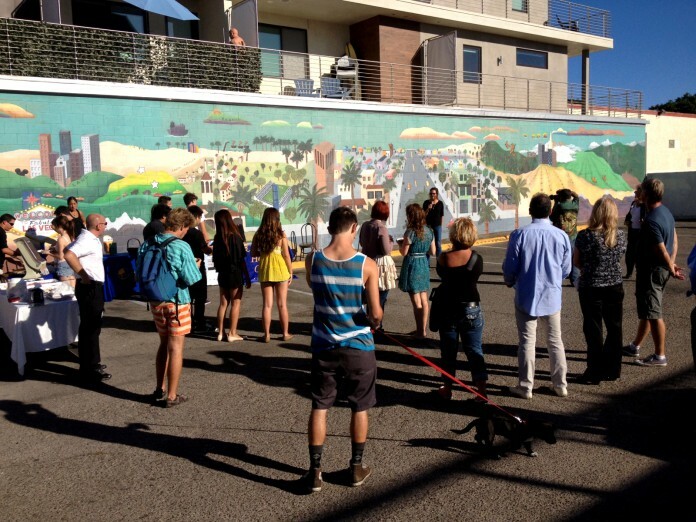 “A View of the World from Isla Vista,” a colorful and inducing mural on the formerly blank Plaza Lofts wall space, was officially unveiled on Monday, Sept. 30, to an eager crowd of students and spectators. The latest production from the University of California, Santa Barbara Urban Art Workshop was made in conjunction with the UCSB Community Housing Office, the owners of the new Plaza Lofts, and Ann Hefferman, a local artist known for her vibrant chalk street drawings. Many of the ideas and a great portion of the involvement came from UCSB students interested in bringing public creativity to the Isla Vista community. Hefferman, beaming in front of her finished product, summed up the program. Richard Gilman, one of the co-property owners of the new Plaza Lofts, also spoke to the opportunity that the mural project offered. “We had this giant canvas, so from the inception of the building we knew that we always wanted to make this a community art project in conjunction with the university,” Gilman said. The mural ceremony featured speeches by Roane Akchurin, manager of the Community Housing Office, and Hefferman, as well as free food from Giovanni’s and Sorriso Italiano. Music by Bob Marley, Dennis Brown, and a Reggae Pandora station provided an enticing, social background beat, while groups of students — going to or from the UCSB campus, or just out on the town — filed into the parking lot to eat, socialize, and view the mural. Akchurin related the project’s intention of developing positive connections between the students and their community. The wall painting centers on IV’s Pardall Street and draws out in a broadening perspective to detail the Pacific Coast — from Mexico and LegoLand to Washington and Canada. Santa Barbara is represented in an Old World aesthetic — lightheartedly titled “Santa Babylon,” the familiar terra cotta roofing of Spanish architecture gives way to Harder Stadium and Storke Tower. Los Angeles is playfully denoted as “La La Land” and even Bigfoot appears in the green woodlands of the landscape’s north. While spanning illustrious locations in California and beyond, the mural transposes humor with an eye for lush detail. “The mural is something unique. I’m from the LA area so it kind of brings me back to home,” said Juan Carlos Gomez, a third-year environmental studies major. “A View of the World from Isla Vista” is based on Saul Steinberg’s New Yorker magazine cover “The View of the World from 9th Avenue.” Stylistically, the Isla Vista mural provides a unique, local enthusiasm, culling together the mythic landscape cartooning of Fernando Botero while tipping its hat to post-modern sensibilities. The viewer stands in the Giovanni’s parking lot, seeing their location illustrated on the mural — in this way, the piece projects the viewer into both existent and abstract realities. Hefferman spoke to the mounting crowd, explaining her leadership role and guidance to students — she recalled encouraging them to use a lot of color and the use of two-foot grid plan. The finishing process of coating the work was not finished until summer, but the mural was virtually finished by the end of Spring 2013. The student artists were all fourth-years at the time of completion and have since graduated. Though none could attend the ceremony, the student’s names are included in the far right to publicly record their artistic contributions. The UCSB Urban Art Workshop is planning on the production of two more murals in the coming year, set for spring and summer. The unveiling event ritualistically ordained the mural as a creative highlight of downtown Isla Vista — aside from its espousal of local inspiration; it affirmed the unity of a multicultural population in our central, melting pot community.